Of a slightly later date, the elegant 6-domed mosque (43'x36') of Baba Adam in Rampal near Dhaka was erected by one Malik Kafur during the reign of the last llyas Shahi Sultan, Jalauddin Fateh Shah in 1483 A.D. It displays the same characteristic features of the period such as the faceted octagonal turrets at 4 corners, the curved cornice, the facade and 3 mihrabs relieved richly with beautiful terracotta floral and hanging patterns. There are three different bays and two different aisles in which this mosque is divided into, it explains how huge this mosque is. The brick built finishing of the mosque makes it look antique and with its architectural design, it sums up to a perfect finish. The tomb beside the mosque contains the grave of the memorable Baba Azad, who set his last breath by fighting in a war. The tomb is known as Baba Adam’s Majhar and is a pretty popular place to travel, if you ever drop by in Munshiganj. A unique fact about this mosque is that it does not have a minaret, it makes the design of the mosque unique too. 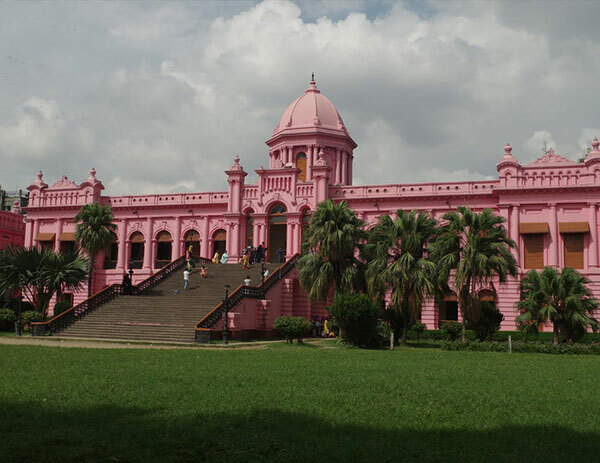 On the Dhaka-Chattogram highway about 29 km from Dhaka, Sonargaon is one of the oldest capitals of Bengal. It was the seat of Deva Dynasty until the 13th century. From that century onward till the advent of the Mughals, Sonargaon was the subsidiary capital of the Sultanate of Bengal. historical and archeological things. Among the ancient monuments still intact are the Tomb of Sultan Ghiasuddin (1399-1409 A. D), the shrines of Panjpirs and Shah Abdul Alia and a beautiful mosque in Goaldi villaae. National Martyrs Memorial is situated in Nabinagar, Savar approximately 35 km from Dhaka. 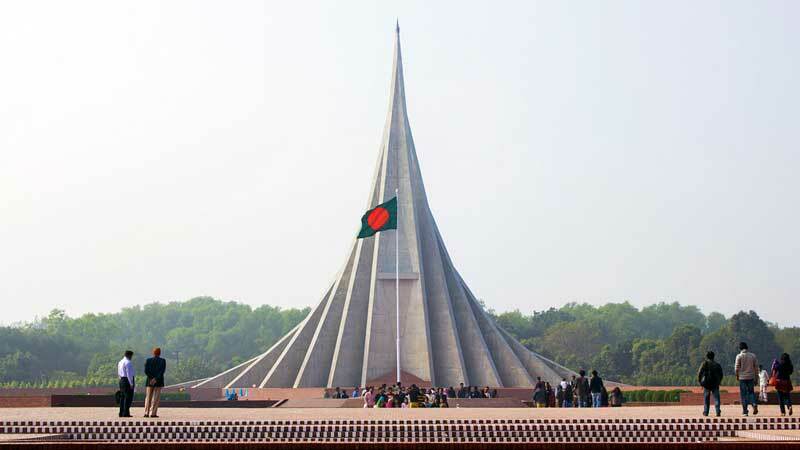 The memorial designed by architect Moinul Hossain is dedicated to the sacred memory of the millions of unknown martyrs of the war of liberation. This Martyrs Memorial is a symbol of Bengali nationalism. It is really a scenic beauty of 108 acre of land. The top of this monument is 150 ft. high, which consists other 07 triangular monuments. Its open 07 days a week besides this monument you can enjoy your foods in Parjatan restaurant opposite of memorial gate. Bhawal National Park is in Gazipur district 45 km far from Dhaka in the north side. It is a vast (1,600 acres) national recreational forest with Picnic spots; jangles of Gajari trees surrounded by a beautiful lake .you can enjoy boat horse riding here. Especially in the winter, season lots of picnic party enjoy their day in this park. Bhawal National Park was popular for leopards and black panthers previously, it was an enhancement to the beauty of Bangladesh’s wildlife. Find out about different plants as there are more than 300 different species of plants and on the other hand more than 150 tree species. Exploring the green natural beauty can be a fascination for many Bengali and visiting this national park can give you a slice of Green Bangladesh mentioned in literature and books. Bangabandhu Bridge is 110 km from Dhaka on the River Jamuna. This bridge is 4.8 km long and it is the 11th largest bridge in this world. It is a real beauty at nights when sodium lights lighten the bridge. Some beautiful resorts have already been established near the bridge to encourage tourists in this area. Jamuna River was renamed to Bangabandhu Bridge, not before a while. 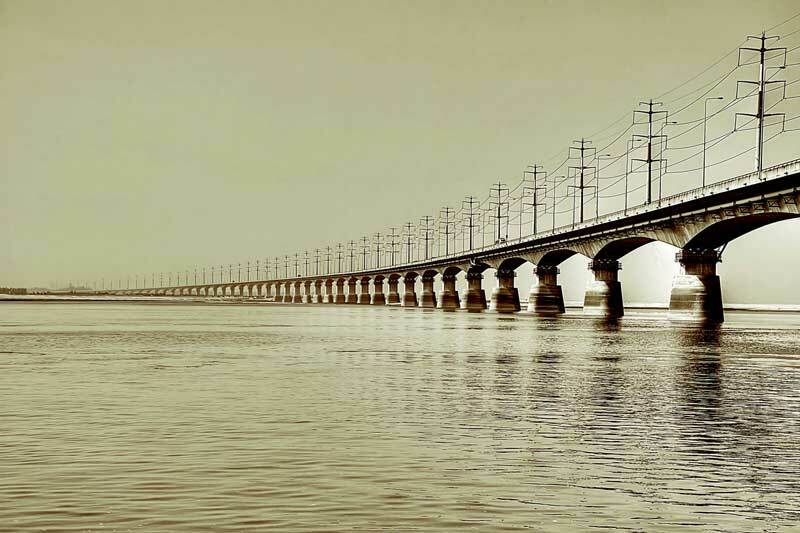 Being South Asia’s sixth longest bridge, it is a pride for the people of Bangladesh. The bridge is a glorious pathway between the Eastern and Western part of Bangladesh. The construction of the business had started in the year 1985 and the architects were fully done with it by 1998. The bridge is situated in the Tangail District and it is a pathway to Sirajganj. Bangabandhu Bridge is not only the 6th longest bridge of South Asia but also the 11th longest bridge in the whole sphere and it is an honor for us. Explore the beauty of Sirajganj and its western bank by standing on the bridge with patriotic pride. It is 144 km far from Dhaka. Here is the graveyard of great Sheikh Mujibur Rahman the father of our national who was killed in the year 1975, 15th August. The place is situated in the sub-district of Gopalganj named “Tungipara”. The father of the nation; Bangabandhu Shiekh Mujibur Rahman, was born in this place too. Visiting this place to show respect to the person, who assisted us to march on the rebellion for our victory is important and that is why people visit this place. Visiting this place from Dhaka is very easy as it is not that far. However, there are different busses, which go to that destination, it is a hundred and forty-four kilometers away from Dhaka, which is an overnight journey. Trying out different traditional food of Gopalganj at that place can be a great experience too.